It’s a statement of fact that completing roof repairs or beginning roof replacement projects is typically not a planned event. Most of us living or working in the Phoenix Valley dread the day that roofing service are needed mainly due to one common reality – money. AZ Roofing Works offers a practical solution to this common hurdle through our robust, diverse, and exceptional financing programs offered to home owners, commercial property owners, and others taking on home renovation or roof-specific projects in Phoenix. SEARCH: The first step is to use the easy to navigate search feature displayed on the right side of their website to find the best loans and 0% credit cards for your specific project. COMPARE: The detailed online search will display multiple 0% credit cards and loan programs to let you determine which credit option is best for you. APPLY: From that point, you can pick the right loan, fill out the secure online application and submit for approval. It’s really that simple. 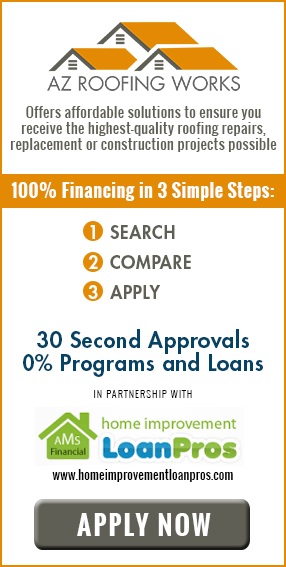 Home Improve Loan Pros offers several featured loan and credit card offers ranging from 0% APR credit cards up to 18 months on home improvement projects, home improvement unsecured loans ranging from $5,000 to $100,000 or smaller $1,000 to $40,000 home improvement loans with competitive financing rates. Financing a roofing project is the best way to improve the value of your residential or commercial property in Arizona. AZ Roofing Works takes pride in offering affordable solutions to ensure you receive the highest-quality roofing repairs, replacement or construction projects possible. We are a Licensed, Bonded & Insured Roofing Company located in Mesa, Arizona. We are the preferred Residential & Light Commercial Tile, Shingle, Foam & Flat Roof Repair and Roof Replacement company serving the Greater Phoenix Arizona area. We offer financing for roof repair and replacements of tile, shingle, and flat/foam roofs throughout the valley. Whether you live near ASU, off the 101 or I-10 – our team of passionate and experienced professional roof financing experts will cater to your needs. Our dedication to craftsmanship, getting the job done right – the first time, and our dedication to open and clear communication are trademarks of AZ Roofing Works. We offer Experience You Can Trust – and we offer FREE roof estimates all the way to full roof replacements and everything in between.